Fenugreek ( hulbah ) it is reported that Prophet Muhammad (s.a.w.) once said "If my people knew what there is in Fenugreek, the would have bought and paid it weight in gold." 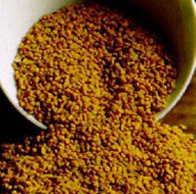 Fenugreek seeds are also known for their anti-diabetic property. 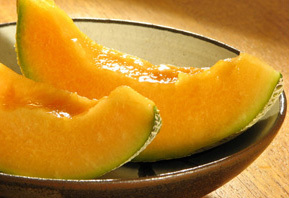 They are also considered excellent to treat arthritis and to reduce blood cholesterol. They also increase breast milk production in breastfeeding mothers. Fenugreek contains natural expectorant properties and is considered ideal for treating sinus and lung congestion. It also helps in loosening and removing excess mucus and phlegm. The mucilage content of the seeds help to cure external boils, burns and ulcers. The most respected book of traditions state that the Prophet Muhammad (s.a.w.s) said, “ Make yours the seed of coriander, for it is a cure of all diseases except swelling [cancer], and that is a fatal disease.” It is also reported ALLAH informed the Prophet, “ She has been given everything.” And then ALLAH revealed that “she” is coriander. Coriander alleviates flatulence and resolves fevers. It is effective in the treatment of leukoderma, and it opens the subtlest networks of the veins. Excess moisture in the body is dried up by the coriander, and it increases milk flow, urine, and menses. It is particularly useful when a person has cold. 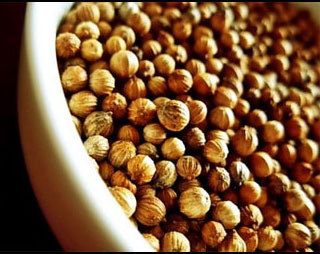 The oil of coriander is a treatment for baldness and scalp problems, and prevents grey hair. The smoke of the burning seeds is an insect repellent. One Hadith reports that nothing is dearer to ALLAH than Henna. The holy Prophet (s.a.w.s.) recommended it for many conditions : bruises, pain in the legs, infection of nails, burns, and to beautify the hair. Henna is noted for its great heat and its ability to excite the passion of love. The perfume made from Henna flowers is considered to be one of the finest in the world. The dyeing of hands, nails, and feet is a common practice in the East, especially for weddings and feasts. Said the Prophet (s.a.w.s.) : "Whenever you eat fruit, eat melon, because it is the fruit of Paradise and contains a thousand blessings and a thousand mercies. The eating of it cures every diseases. None of your women who are pregnant and eat of watermelon will fail to produce offspring who are good in countenance and good in character." The Prophet (s.a.w.s.) took melons with fresh dates. The Prophet (s.a.w.s.) 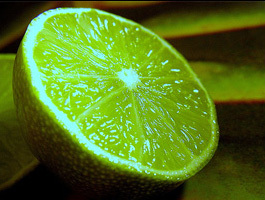 is reported to have said, "The citron is like a true believer : good to taste and good to smell." Citron strengthens the heart, dispels sadness, removes freckles, satisfies hunger, and slows the flow of bile. The wife of the Prophet (s.a.w.s) used to treat blind persons with citron dipped in honey. Citron is best taken about ten minutes after conclusion of meals. Sweet pomegranate are preferred over the sour. The juice stems coughs. All kinds of pomegranate settle palpitations of the heart. 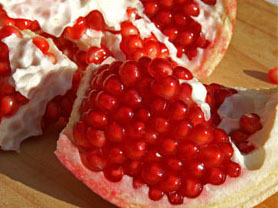 Hazrat Ali(r.a.) said that the light of ALLAH is in the heart of whoever eats pomegranate. It is also reported that one who eats three pomegranate in the course of a year will be inoculated against ophthalmia for that year. Said the Prophet (s.a.w.s.) : Pomegranate "cleanses you of Satan and from evil aspirations for forty days." The Prophet (s.a.w.s.) was reported to have once remarked that vinegar was the seasoning of all the prophets who came before him. Vinegar is both cold and hot, nearly balancing between the two. 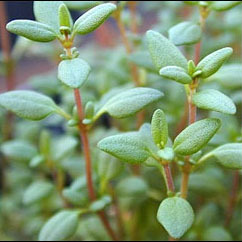 Mixed it with rose water, it is an excellent remedy for toothache and headache. Vinegar dissolves phlegm. Another Hadith states that a house containing vinegar will never suffer from poverty. It is said that to eat Quince on an empty stomach is good for the soul. Cold and dry, Quince is astringent to the stomach, and it checks excessive menstrual flow. 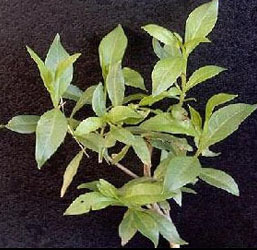 A few seeds placed in water will, after a few minutes, form amucilage which is an excellent remedy for cough and sore throat, especially in the young. 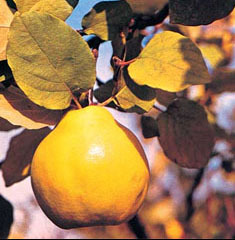 Quince is also excellent for pregnant woman, gladdening their heart. The holy Prophet (s.a.w.s.) said, "Eat Quince, for it sweetens the heart. For ALLAH has sent no Prophet as HIS messenger without feeding him on the Quince of Paradise. For Quince increases the strength up to that of forty men." Milk: The Prophet (SAW) said that milk wipes away heat from the heart just as the finger wipes away sweat from the brow. It strengthens the back, increases the brain, augments intelligence, renews vision & drives away forgetfulness. Barley:The Prophet Muhammed (pbuh) recommended talbina (a meal made from powdered barley) for the sick and grieving. He is quoted as saying, “At-talbina gives rest to the heart of the patient and makes it active and relieves some of his sorrow and grief” “The Talbina”: is a meal made by mixing 2 spoons of barley and a cup of water, cooked for 5 min, after that a cup of yogurt and bee’s honey is added, it is called Talbina which comes from the Arabic Word Laban meaning yogurt because of its resemblances to the yogurt, as it is soft and white. And aicha said that the prophet peace be upon him has advised us to use it as a medicine, as he said. Its a cure for sadness:“At-talbina gives rest to the heart of the patient and makes it active and relieves some of his sorrow and grief” (Bukhari 7:71#593). It is narrated that the wife of the prophet peace be upon him “Aisha”, if one of her relatives die, and after the funerals, used to gather the women in the familly, and ask for a pot and cook the talbina, after that she would prepare some kind of a meal called: thrida”, which is mainly peaces of bread emerged in a sauce. And she would poor the talbina on it. And tell the women: eat from it, as I heard the prophet peace be upon him saying. 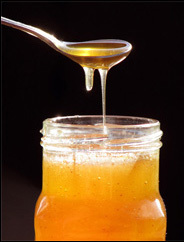 Honey: Considered to be the best remedy for diarrhoea when mixed in hot water. It is the food of foods, drink of drinks & drug of drugs. It is used for creating appetite, strengthening the stomach, eliminating phlegm, as a meat preservative,hair conditioner, eye salve & mouthwash. It is extremely beneficial in the morning in warm water & is also a sunnah. Mushroom: The Prophet ( SAW) said that mushroom is a good cure for the eyes, it also serves as a form of birth control and arrests paralysis. Grapes: The Prophet was very fond of grapes, it purifies the blood, provides vigour & and health, strengthens the kidneys & clears the bowels. Dates: The Prophet (SAW) said that a house without dates has no food, also to be eaten at the time of childbirth. Figs: It is a fruit from paradise and a cure for piles. Melon: Melon contains 1000 blessings & 1000 mercies, the Prophet SAW said "None of your women who are pregnant & eat of water melon will fail to produce offspring who are good in countenance & good in character. Pomegranate: The Prophet (SAW) said it cleanse you of Satan and evil aspirations for 40 days. Water: The Prophet (SAW) said the best drink in this world & the next is Water. When you are thirsty drink it by sips and not gulps. Gulping produces sickness of the liver.